The process of setting a Stop Loss (SL) and a Take Profit (TP) price target is one of the most important processes a retail forex trader will engage in. Markets are not always predictable, and that is why these two tools are used to confer a measure of protection to the trader’s positions and account capital. The Stop Loss is specifically an instruction to the broker to close a trade position automatically when price action has moved against the trader’s position as to cause a negative value to the trade. The Take Profit is an instruction to the broker to close the trade position automatically when price action has moved in the trader’s chosen direction to a certain price level as to cause a positive value to the position. The use of the SL and TP is not supposed to be done arbitrarily; rather they should be used according to carefully laid out guidelines and these are what will be discussed in this article. Markets always have reversal points, and trades do not always take off in the chosen direction when the entry is made. Therefore, the aim of setting a stop loss is not just to put a stop point on negative price movements, but to ensure that the level where the SL is placed is not one which will choke the trade and end it prematurely without giving it a chance to achieve positive potential. A stop loss is principally used to protect the trade capital by capping losses on active trades. However, a benchmark must be used in setting the stop loss. Probably the most appropriate benchmark of all is to use support/resistance areas. Usually, a stop loss should be set below a strong support (long trade) or above a strong resistance (short trade). These should be key levels which have been tested by price action and seen to hold up well. Whichever tool you use, the aim is the same. It is believed that the key levels of support or resistance will combat any attempts at price movement to go against the trader’s stops. If these key levels are successfully broken by negative price movement, then it is assuked that price would continue to move in the direction of the breach and this is when the stop loss should kick into gear to protect the trader’s capital. In this snapshot below, we demonstrate the use of the Fibonacci levels as a tool for setting the stop loss. The previous resistance seen at the 100% Fibo retracement level serves as a good benchmark and the stop loss can be set above this mark (1.10860). The second point is the resistance seen at the 78.6% Fibo retracement line, which marks the line at which the upside retracement of price action within the downtrend ends. The stop loss can then be set between this line and the 100% retracement line. In both scenarios, the resistance lines formed by the 78.6% and the 100% Fibo retracement lines are very solid and setting the stop loss just above them will not jeopardize the trade. This also serves the advantage of giving up very little risk to the market and opening the trade up for a good reward. Location of the nearest support/resistance areas along the direction of your trade. The risk-reward ratio (RRR) for the trade. Appearance of any reversal patterns. How do these factors affect the location of the TP? The reason why the nearest support (long trades) or resistance (short trades) areas must be considered is very simple: the price action is most likely to stall at these areas. If you set your TP beyond these levels, there is every possibility that the trades may reverse against your position. You need to use these levels to your advantage, and this means that your TP must be set to a point which precedes any of these support/resistance points by a few pips. That way, you are sure that when price gets to these key levels, it would already have closed out your trade in profit. When it comes to the risk-reward ratio (RRR), you need to check to see if your expected TP area will give you a return that is at least 2 times or even 3 times the number of pips you have used in setting the stop loss. Anything less than this should not be considered. Do not fall into the trap of trying to force your TP to conform to this without considering where the nearest key level of support/resistance is. If you have set your TP according to the directives stipulated above and it does not give you at least 100 pips where you have set 50 pips as the SL, you should abandon the trade and look for better opportunities. This trade setup shows the double bottom pattern. 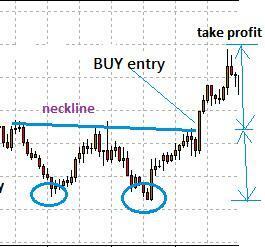 As a rule, the TP point of this trade should be the same distance between the neckline and the bottoms. We can see that as soon as price got to the TP point, it started to reverse. If a trader had decided to get greedy by setting the TP higher up on the chart, any profits in the active trade would have been eroded. This is not a pleasant situation and it can be avoided by following the rules. Reversal patterns refer to the technical patterns seen on the charts that indicate a change in the sentiment of market participants. These are the reversal candlestick patterns and chart patterns. Reversal candlesticks tell a story of what buyers and sellers are doing in the market. Some patterns are more indicative of market reversals than others. Special note should be taken of candlestick patterns that comprise 2 or more candlesticks. Examples are the engulfing patterns and the doji star patterns. This snapshot shows how a bearish engulfing pattern halted the upside move of the currency pair. A bearish engulfing pattern signifies buying activity (1st candle) which is superceded by much stronger selling activity (2nd candle). A trader who sees this formation while in a long trade will do well to exit the trade immediately or face losing money to a reversal.